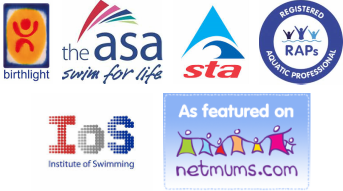 Swimming lessons for babies, toddlers and Pre school children are charged at £48.50 per child and school age children are charged at £44.50 per child, once a month, by standing order on the same date each month. This pays for one 30 minute lesson, once a week for 50 weeks a year. There will be 2 weeks during the year where there are no lessons. New swimmers may be offered a free trial. We cannot guarantee to put friends or siblings in the same class, but we will do our best to accommodate where possible. The first payment is due before the first lesson following a trial and must be paid in advance of lessons. Payments are to be made by standing order, once a month on the same date at £44.50 or £48.50 (age dependant) a month in advance. Payments must be continuous on the same date each month and cannot be carried over for missed lessons or transferred to another swimmer. A late payment fee of £10 maybe charged if a payment is not made in a timely manner. - Once a booking form is received and the first payment is made, lessons are booked until you tell us you wish to stop, you will not lose your place or have to re-book at any time providing payments are up to date. lessons. Standing orders have to be cancelled by the customer, AQUA JEMS LTD is unable to cancel or amend standing orders. All lessons will need to be paid for, for the duration of the 4 week notice period. - Unfortunately, we cannot issue refunds if you are unable to attend a lesson, our costs still have to be met. - Please let us know if you are unable to attend a lesson with plenty of notice. Replacement lessons at an alternative pool or on another day maybe offered. This is subject to availability and cannot be guaranteed, please email aquajems@outlook.com to arrange any replacement lessons you wish to take. Missed lessons can be “banked” and taken at your convenience but are only available whilst a swimmer is current and up to date with payments. Replacement lessons are not transferable to another swimmer. A maximum of 6 replacement lessons maybe taken in a 12 month period. using the contact number(s) that you have provided and possibly by leaving messages. Please notify us of any change in contact details or of a new home address. - In the event of a cancellation by us, we will issue a refund for the value of the lesson £11.50 for babies, toddlers and Pre-school age children and £10.50 for school age children. - We want to keep our poolside environments, safe, clean and tidy for all users so please remove all swimmers outdoor shoes. Spectators may use the blue shoe covers if preferred. With this in mind please refrain from eating in the changing rooms and on poolside. - Baby changing mats are provided for your use in the changing areas; never leave your baby unattended whilst using them. - A nappy bin is provided for your convenience, please place disposable nappies and swim nappies in this bin after use. - AQUAJEMS LTD cannot take any responsibilities for any loss or damage to your property, please do not leave property unattended in the changing rooms. - If you do not wish to have photographs taken, please indicate “No Photographs” on your booking form. - Photographs taken do remain the property of AQUAJEMS LTD and may be displayed on our website or for other marketing purposes but only with your permission. - Photographs are taken by the swimming teachers, not professional photographers and we cannot guarantee the standard of the photograph or that there will be a photograph of each child. Electronic copies will be provided to parents free of charge. - If you would like to take your own photographs please check with the swimming teacher first. email as well as your landline if possible and your current address. - For all children under 3 years, we ask that one adult be in the water with each child. - As your child grows in ability and confidence in the water, usually approaching age 4 your teacher will discuss with you the procedure for developing solo swimming. - Additional spectators are welcome to watch from the poolside areas. - Children may not go on the poolside or watch lessons unsupervised. - Please notify us of any medical conditions of all swimmers. - Please do not swim within 48 hours after stomach upsets such as sickness or diarrhoea, or other contagious illnesses, please speak to Jennie on 07881773869 anytime if you require clarification on the guidelines for infections or contagious illnesses. - Please notify us before the lesson of any relevant health issues. As all of our swimmers safety and welfare is important to us we reserve the right to refuse entry to the pool if health conditions or behavioural/emotional needs are deemed to affect other swimmers. - We want our lovely pool to stay clean and safe so therefore all babies and children who are not toilet-trained must use the double nappy system in the pool at all times, please ask if unsure. - Running is not allowed on the poolside and children must be supervised at all times on poolside and in the changing rooms. - We politely request that our customers respect the privacy and property of other centre users. For new swimmers booking by e-mail or over the phone - to abide by distance selling regulations, you have a 7 working day cooling off period from the date of your booking. Your signature on your booking form is taken as acceptance of these terms and conditions. ​If you have any questions relating to these Terms and Conditions please get in touch via email to aquajems@outlook.com and we will be happy to help.